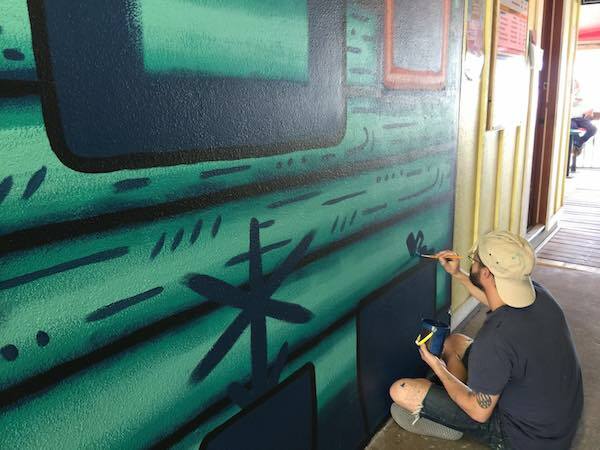 Nick Fisher, an artist from Sebastian, paints a mural at the Captain Hiram's Resort. 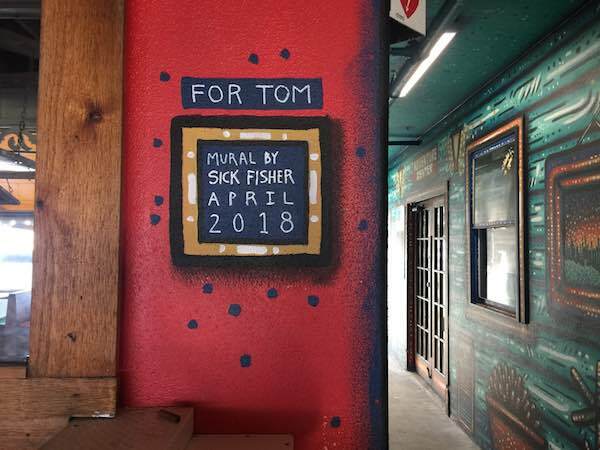 SEBASTIAN – Nick Fisher received a call from Will Collins (son of the late Tom Collins) about painting a mural in the exterior hallway at the Captain Hiram’s Resort. Fisher and Collins grew up together and have known each other since pre-kindergarten. 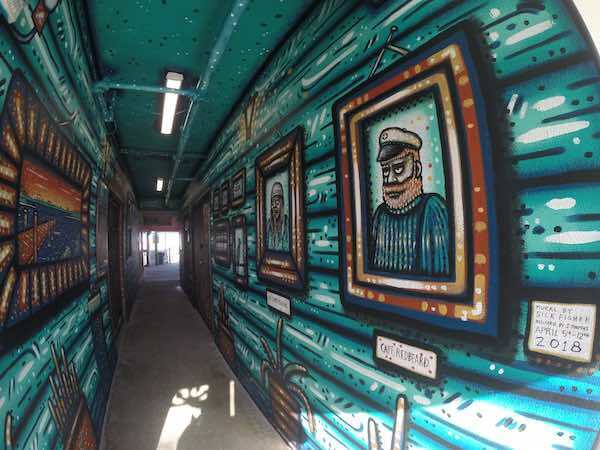 Within a week, Fisher transformed one of the entrances to the Captain Hiram’s Sandbar into a work of art. 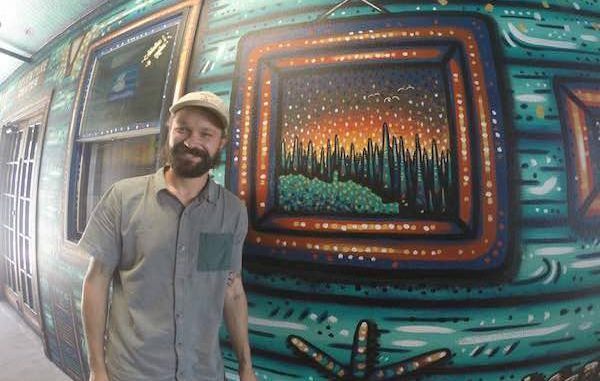 He worked long hours with minimal breaks, and at times answered questions from local patrons about the new mural as they walked by. Fisher, 32, grew up in Sebastian and is proud of his roots. He earned a Bachelor of Arts from Florida State University. After college, Fisher moved to Chicago where he’s done well in the art community. He is planning to move to Los Angeles but will travel the country to paint. He already plans on coming back to Sebastian in June. The early stages of painting the hallway. The store at Captain Hiram’s has a new look. The artist even worked on a satellite dish while painting the mural. 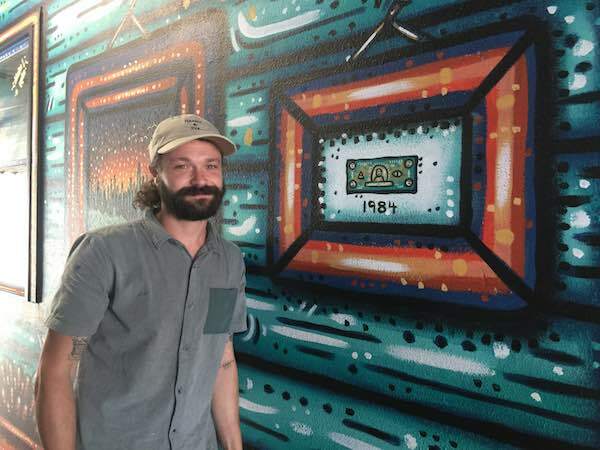 Prior to the new mural, Fisher has done other projects for the Captain Hiram’s Resort. “I did their menus once, a couple of years ago, I kinda work for them on and off. Will called me and this time he said we really wanted to do something about this hallway,” Fisher said. “We spoke briefly about what we could do here, like the theme, but not much more than that. No sketches, no anything other than just mutual trust,” Fisher added. The original idea for the hallway was to make it an aquarium so that there would be fish everywhere as you walk through it. Fisher liked the idea, but he thought they could do more. 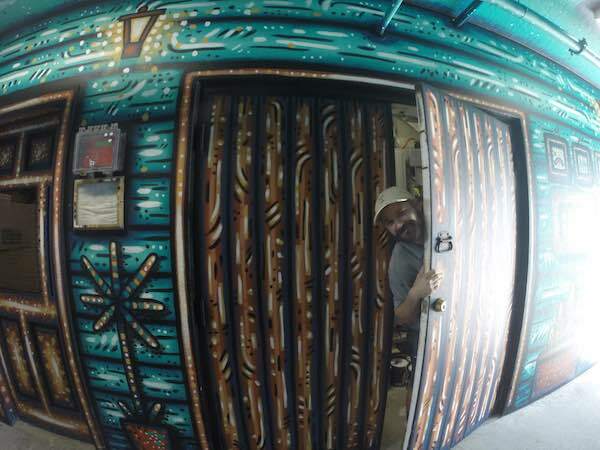 Nick Fisher loves painting doors. This door is in the middle of the hallway. “Within that idea, we could do so many more different things. We kept the hallway a hallway. Nothing is finished with me unless it’s a little overwhelming,” Fisher said with a grin. When painting, Fisher likes to end each day as a new chapter when working on a project. He doesn’t leave one chapter unfinished. Most people will think the project is complete every day, but Fisher knows it’s not even close to completion. He explained that he gets an incredible amount of enjoyment seeing it as if he’s seeing it for the first time. “I knew I was going to get what I wanted because I’ve done it enough to know that this technique works the way I want it. However, when it’s done I still get an incredible amount of enjoyment seeing it as if I’m seeing it for the first time,” he said. A painting of the first $2 bill received at Captain Hiram’s. The hallway has different paintings, one being a $2 bill. There’s a story behind that. “So a lot of businesses will frame their first dollar, right? So, I did that. Then Will came up to look at it and said ‘you won’t believe it, but just a couple hours ago I was going through my dad’s office (Tom Collins) and found the framed first dollar, and it was a $2 bill,'” Fisher said while pointing at the mural. Fisher says he’s booked through the end of summer. 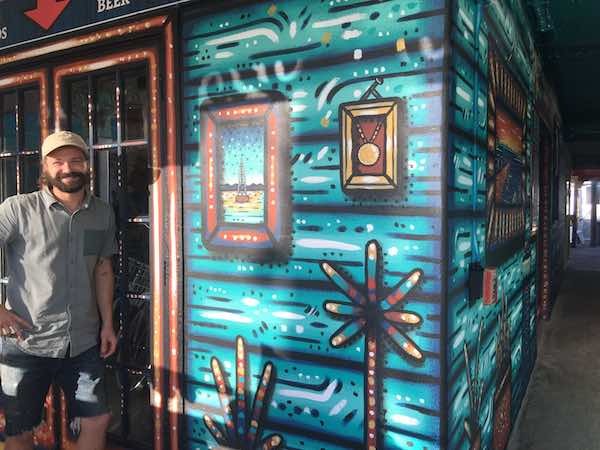 He has a handful of things to do in Chicago, then it’s off to Michigan where he will paint an old gas station. From there Fisher will come back to Florida to visit for a few days before driving to Los Angeles. Nick Fisher also uses the nickname “Sick Fisher” that he got in high school. 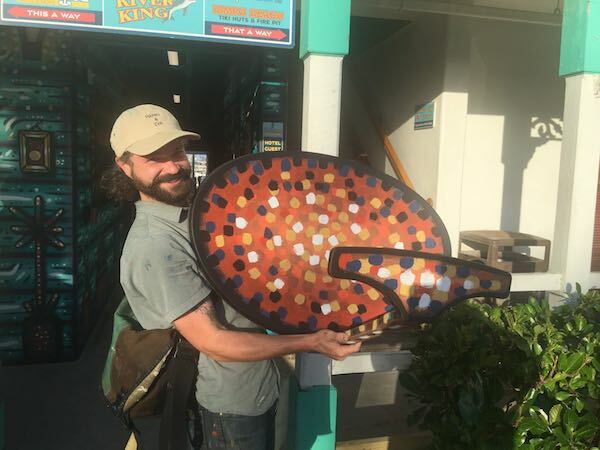 To learn more about this artist, visit his Sick Fisher Art website and his Instagram account.